If you have questions about the Pixel Slam Jam, want to gush about someone's submission, have ideas about a theme, or just want to talk about an ongoing or past Jam, this is the place! Pixel Slam #7 took place March 5th - March 15th 2018. The prompt for this jam was a Pokemon using an attack. 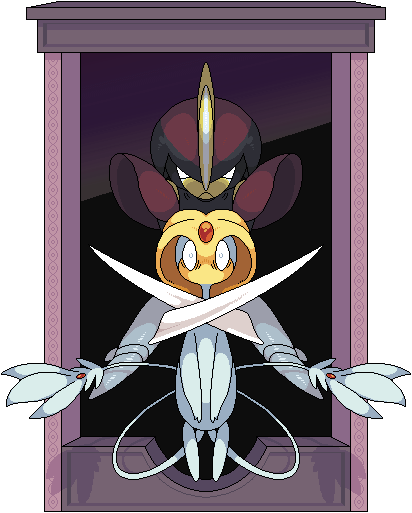 Clifford with Bisharp using Guillotine against Uxie, and Cilerba with Sandygast using Ancient Power. Pixel Slam #7 took place October 21st - October 30th 2017. The theme for this jam was to design a costume for a trainer and/or an existing Pokemon. 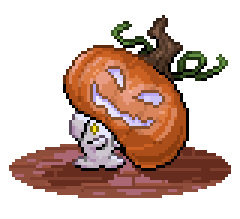 artcanary with a halloween friend and Tomix9tomix with a spooky Sudwoodo. Pixel Slam #6 took place June 1st - June 10th 2017. The theme for this Slam Jam was to design a new trainer class that specializes in a certain type of battle mode. 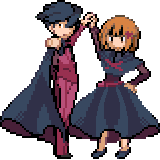 Rotation Battle Specialist, pedrohjv with Roulette Queen, AceTrainerGresh with Inverse Battler, Makattack202 with Inverse Maiden, and kirlial with Dance Partners - Double Battlers! Pixel Slam Jam #5 took place April 14 - April 24, 2017. The theme for this Slam Jam was to design a new legendary Pokémon born from an already existing Pokémon. The winners of the Pixel Slam Jam #5 are Luka S.J. with Wailestial, and Hematite with Ascaleon! What is the Pixel Slam Jam? The Pixel Slam Jam is a friendly competitive event where participants create pixel art based on a theme. The submissions can be spliced sprites or scratch work, just so long as it's pixel art style! The goal of a Pixel Slam Jam Event is to give the Relic Castle Community an excuse to sprite for fun without having to worry about any kind of restrictions that come with spriting something for a game project. After everything is submitted, the judges then give out a Pixel Slam Jam Badge to the entry/entries they feel utilized the theme best. Winners aren't chosen purely by technical skill, but also through their original design choices, and any backstory they put into their sprite; so even if you're just getting started with pixel art, we'd love to see you attempt the Slam Jam! Whenever there is a Pixel Slam Jam underway, it will have its' own thread separate from this one. Just post your submission into the active Pixel Slam Jam thread, and you'll be entered. You may only submit one pixel work per Jam, and it has to be a sprite you made yourself, for that Jam. Sprites made before the jam, even if they were made by you and fit the theme, are not allowed. You're welcome to sprite in whatever software you like, and use any variety of pixel art style. Sprites do not have a color/size limitation, and they do not have to meet any standards of RMXP or other game making programs. Only post your submission once it is finished. You are allowed to edit your post before the Jam ends, but edits should not be huge changes to the artwork you're submitting. Collaborative entries are not allowed unless specified in the criteria for a specific jam. Congratulations to Luka and Hematite! Between Luka's graphical skills and Hematite's design skills, I knew your entries would do well! I really appreciate the compliment to the technique! <3 I was worried some parts would be hard to read (especially the red patterns), so I'm really glad you think it came out well!! 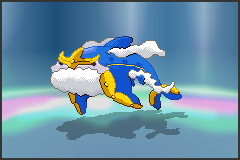 And I really had a lot of fun with the design, because I'm so used to designing Megas and evolutions - I've never given thought to a Legendary form, so this was a really new challenge for me, and the idea for Ascaleon as a punishment came about from the fact that the one thing Megas and full-time evolutions can't be is worse for the Pokémon, haha - it helped push me to design something really different from my comfort zone, and I'm so happy it paid off!! Having read the criticism, that's actually really good advice and I'll make sure to keep it in mind! The feet definitely do look a little too much like puddles, haha. The idea was just that they had circular segments, but I think the shading made them look really rounded, while I meant for them to be flat circles, not domes - I guess I was paying more attention to the lineart and didn't notice the shading affecting how the shape would be perceived! Kind of amusingly, one of the earlier concepts did have them melting into the earth, but that was scrapped and not what I was going for here! XP And the sand tail needing to be grainy makes a lot of sense! 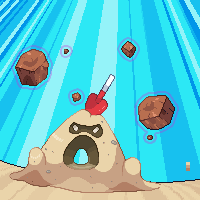 It does look a little too "clean" right now - looking at Pokémon like Hippowdon for comparison, sand usually would be represented with more dithering than well-divided segments! 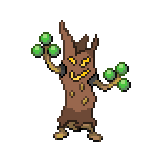 Thanks for pointing those out so I can keep them in mind for the future (and since a Fakemon in my game also has sand in its design, that will be very relevant when I sprite it, too)!! Congrats to Luka, too!! Wailestial definitely also stood out to me as amazing - I love the color scheme, and the airship look is awesome!! Congratulations to everyone who submitted! I really enjoyed each and every entry, and those that added lore and WIP/design info even more so! Congrats, guys! It was awesome seeing everyone's ideas and how they went about bringing their ideas to life. Now, time to wait for the next one. Thank you guys for the lovely new badge. In the sea of awesome pixel art, I feel incredibly honored to have been picked out for the badge. I wasn't really expecting anything major. Between the forum reboot, and everyone's contributions (and even those daily discussions over at Discord) I have to say that I feel really inspired to try and further brush up on the quality of stuff I want to post here. As a final statement; congratulations to Hematite. The sprite and the concept behind this look and sound terrific, and it is a privilege to be sharing the #5 badge with you! Congrats to both! You did an amazing job and your artworks look amazing! Can't wait to see if you keep going for the next one! Good job to everyone who participated. 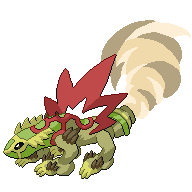 Y'all made some impressive sprites, and I enjoyed witnessing the creativity that you all demonstrated through the types of legendaries that you made. Also, thanks to the judges for the thorough critique! I'm sure that everyone who opted into it really appreciates the thoughtful review that you put into your comments. Pixel Slam was a blast to watch! Everyone's designs and stories were really fun to see, I'd love to encounter any of them in a fangame! Congratulations to Luka and Hematite, you both definitely deserve it! I think you both went really outside of the box in your lore and designs, and it turned out wonderfully! Does the special battle mode need to exist in canon pokemon games? But if you want to it'd probably be alright to use your own style if it's explained thoroughly. Aah, wow, congratulations to all of the winners!!! I definitely agree - all of the entries are amazingly well done! 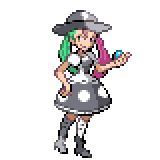 I couldn't make a Trainer sprite if my life depended on it, haha; these all look fantastic and, fangames aside, wouldn't even look out of place in an official game!! Here in our beautiful communist society, everyone's a winner! Nah really though, everyone's sprites were great. It's understandable that it was hard to pick a winner. 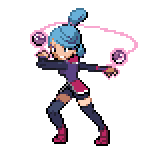 Though I'll admit I especially liked @Alaguesia's sprite. The theme and the general spriting was impressive, though that isn't to discredit anyone else's. Wow, I was not expecting to actually get the badge. Based on everyone's favorite emoji. Attempted a Lillipup as an Ewok and that crashed and burned, so I looked up other dumb/weird halloween costumes and stumbled upon this idea. I'll accept critique, as well. "help i'm literally being eaten alive by this mass of poop"
oh jeez thank you so much??? *A* i was not expecting that at all!